Ni’ilya is located in the west part of Gaza District, south of al-Majdal, east of al-Khisas, as shown on the map. The center of the town of Ashqelon, established in 1948, is northwest of the Ni’ilya village site; the town has expanded onto village lands. The village has been obliterated, and the site is overgrown with wild plants and a few sycamore trees. 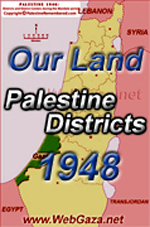 This entry was posted in Palestine 1948, Uncategorized and tagged Ni'ilya. Bookmark the permalink.